The SunBriteTV Veranda Series TVs now offer a premium 4K UHD HDR (High Dynamic Range) screen with direct LED backlight and are up to 50% brighter than indoor TVs. These weatherproof TVs deliver a breathtaking, vivid picture, and the HDR offers a much wider color gamut than non-HDR TVs, which helps represent the colors more realistically. The Veranda Series TVs are optimal for full-shade outside living areas like a covered patio or screened gazebo. SunBriteTV's durable aluminum enclosure protects against rain, snow, extreme temperatures, dust, salt and insects. They also have an easy cable-entry system and a generous weatherproof media bay for popular streaming devices (RoKu, Apple TV, etc). The Veranda Series includes 20W built-in speakers and supports HDMI 2.0 and HDCP 2.2 to help ensure compatibility with 4K sources and streaming services. 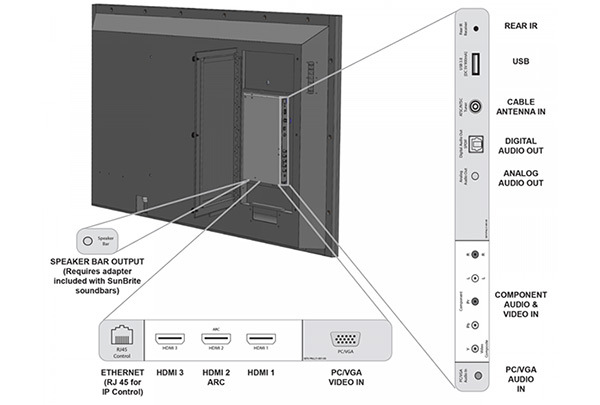 It's equipped with 3 HDMI and 1 USB inputs for a variety of connectivity options, as well as HDMI ARC on 1 input, and both IR and IP control. 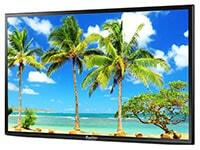 This line of SunBriteTV outdoor televisions are specially engineered for shaded outdoor areas. If the TV will face the sun directly, see the SunBriteTV Commercial Pro Series models. For use in partial sun, check out the SunBriteTV Signature Series S-43, S-55, S-65 and S-75. • Gives you the durability and safety of a dedicated outdoor TV at an affordable price. 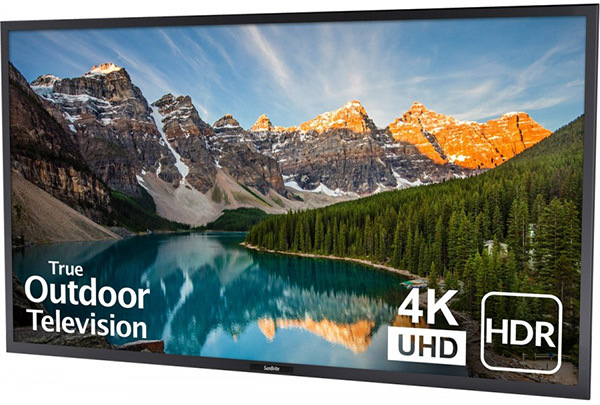 • Premium direct-lit 400 NIT 4K screen with HDR - 50% brighter than indoor TVs. • Operates in temperatures ranging from -24° up to 104° F.
• Innovative large media bay and installer-friendly cable-entry system. Direct Sunlight: Best in shaded areas. Smart TV: No, but it's compatible with popular streaming devices.